It may sound a little odd to suggest that Daawat is somewhat a hidden gem, located as it is in Covent Garden, half way along The Strand! 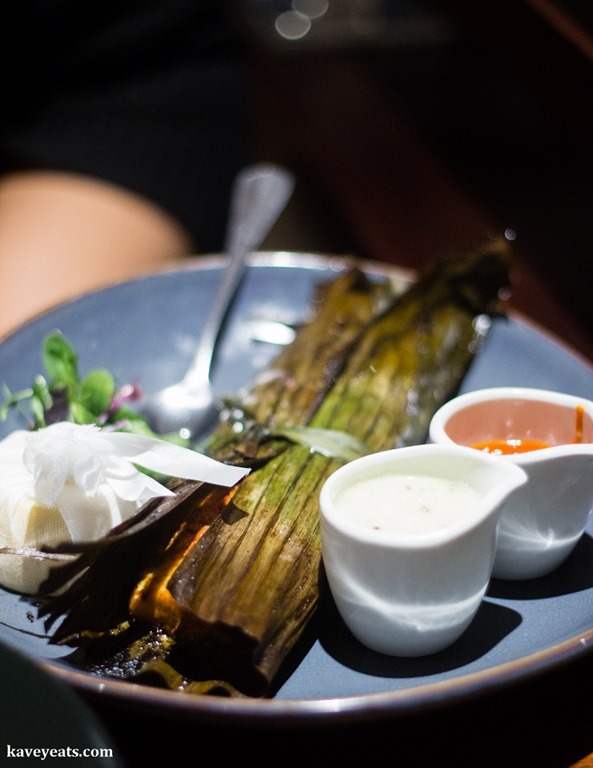 However, the external door to this Indian restaurant is on small and quiet Burleigh Street and most customers enter via the internal entrance within The Strand Palace Hotel. Even with a bright red frontage and sign that curves out over the street, it’s easily overlooked in favour of the oh-so-many places vying for attention in the area. My impression is that diners who aren’t guests of the hotel are rare, and that’s a crying shame because the food we ate was terrific. The space inside is large, split across two levels, one looking down over the other. It’s light, bright, and perfectly comfortable but rather same-old same-old and doesn’t do itself any favours in trying to shrug off the hotel restaurant epithet. 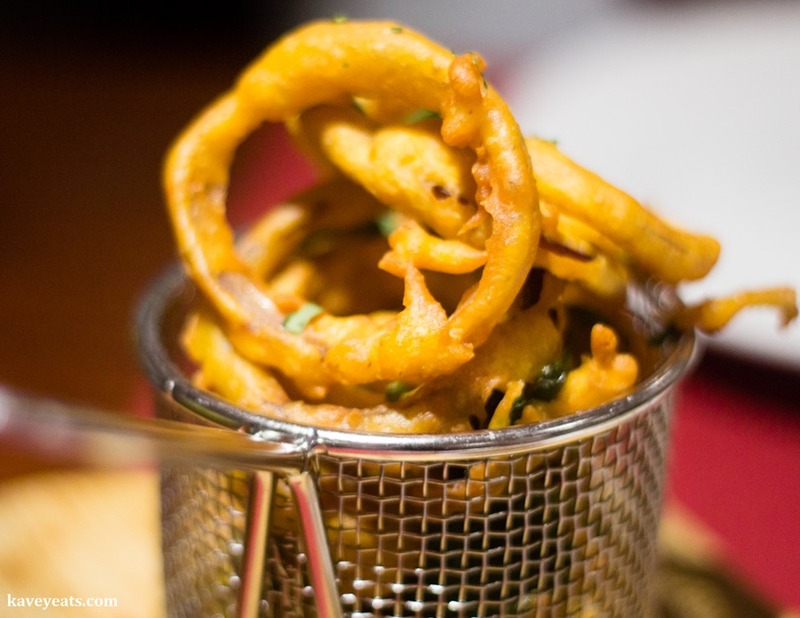 The food, on the other hand, makes it into a ‘destination restaurant’ in my book – that is one worth seeking out if you’re in the mood for good Indian. The kitchen is headed up by chef Asharaf Valappil. Born in Kerala, Valappil was bought up on South Asian food. His menu delivers tastes and techniques from Kerala and the rest of India with additional influences from the spice route and the Middle East. 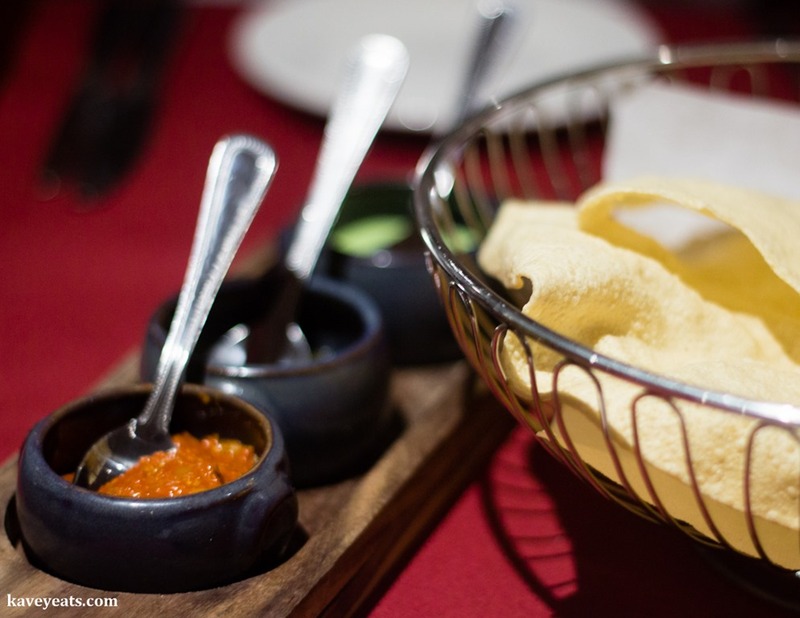 First, Poppadoms (£4) with homemade chutneys. Each chutney had punchy flavours and a decent kick of chilli heat – I’d rate my mum’s green chutney as better but the other two were pretty good. Our first starter was a portion of Pakora (£5.50) served with a pineapple and black onion seed relish. Superbly crisp and hot out of the fryer, the pakoras included onions, padron chilli peppers and baby spinach leaves and were very good. And very quickly gone! The relish too. 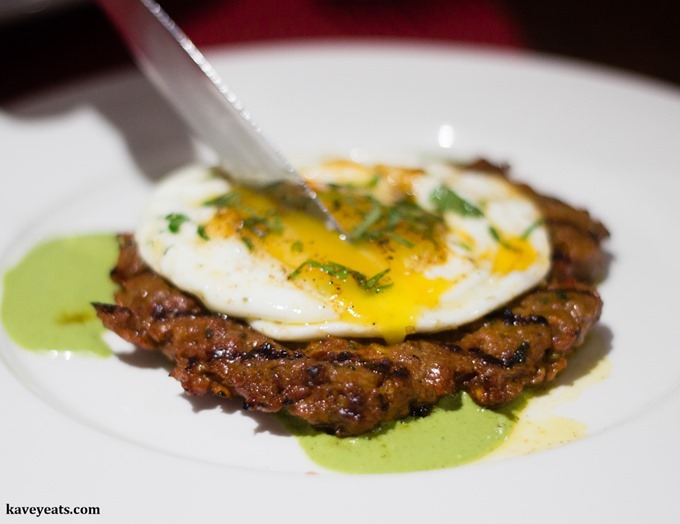 Also delicious was the Chappli Kebab (£7.95) – a beautifully spiced minced lamb patty served with a fried egg and some green chutney. The texture of the meat was a touch overworked, giving it a little more chewiness than ideal, but that’s a minor quibble about a decent dish. The first main we chose was the Duck Mappas (£14.50), described as duck breasts cooked in a mild creamy coconut sauce. In fact, the duck slices were cooked separately and served alongside the sauce, but this worked very well. On first glance, I thought the duck might be overcooked and a little dry but actually, it was soft and tender. The sauce was magnificent; rich and full of flavour with just the right level of chilli heat to add interest without overwhelming the taste buds. 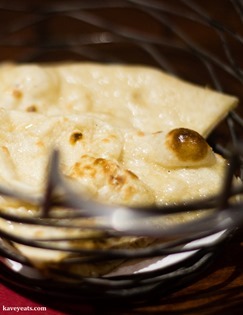 I’m glad we had a portion of Butter Naan (£3.50) to mop it all up! 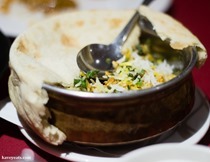 Our second choice was the Lamb Biryani (£13.95). Although everything we ate was delicious, I’m pretty sure it was this one dish that won my heart. Sealed for traditional dum pukht cooking with a bread dough lid, aroma-laden steam billowed out as soon as we tore the lid open, revealing tender chunks of lamb and perfectly cooked basmati rice. 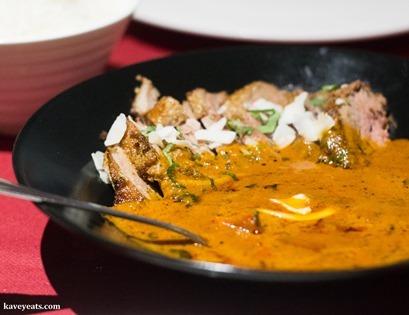 This was as good as any biryani I’ve had – the lamb was tender and beautifully spiced, but the flavour of good quality aged basmati rice came through clearly too. Just fabulous; don’t fail to order this if you visit! 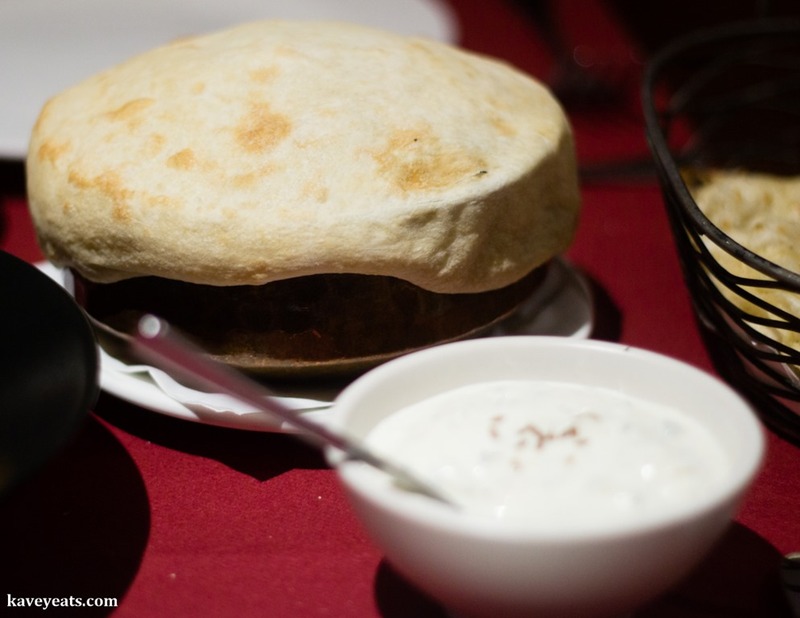 The biryani comes with a bowl of Raita, which may also be ordered as a side for £3.50. 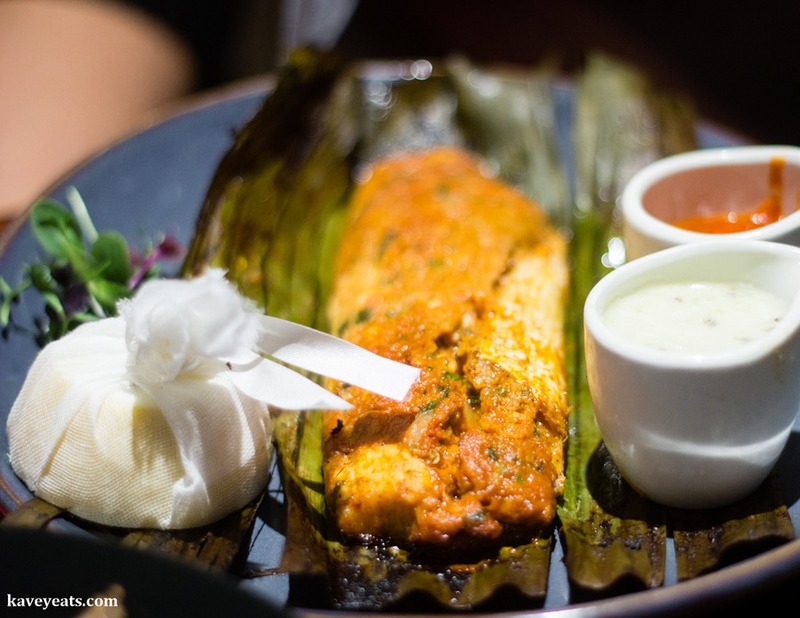 Keen for us to try another of their specialities, the kitchen sent out an extra dish – the Seabass Varuval (£15.75) cooked in a Chettinadu spice blend. Wrapped inside a banana leaf to cook in its generously applied spicy marinade, the fish inside was soft and moist – the flesh flaked apart easily. 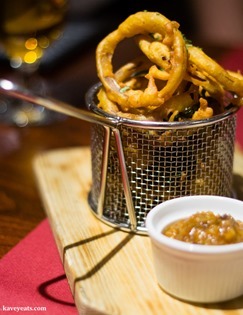 We really appreciated being able to try this lovely dish, but would recommend two mains as plenty to share between two. We didn’t really need dessert, stuffed as we already were, but ‘need’ is a funny word, and I felt a strong urge to try them. Mini Gulab Jamon (£6.95) were delicious but I’d much rather have had double the number of tiny saffron syrup-soaked balls and no bland pistachio ice cream with its chocolate garnish. Likewise, the three little Chocolate Samosas (£7.95), stuffed with a tasty coconut and milk chocolate filling, were somewhat dwarfed by the mango sorbet. An extra samosa and a smaller scoop of sorbet would have suited us better. Prices for a couple of the dishes felt a touch high, though I’m conscious of that Covent Garden address and the fact that the restaurant sits within a historical hotel. But there’s plenty more on the menu that I’m keen to try nonetheless, and the unusual Indian Afternoon Tea also appeals. Kavey Eats dined as guests of Daawat Restaurant. 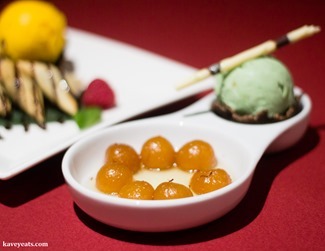 27 Comments to "Daawat on The Strand | Great Indian Cooking"
This all sounds so tasty! I have found ‘ok’ Indian restaurants here in New York, but nothing that has blown my mind. If you get wind of any names either here or in Chicago please let me know! I’ve never done too well on Indian food in the USA, though I imagine there will be some great options in those communities where more of us have immigrated. If I hear of anything in those two cities I’ll let you know! By the way, when are you coming back to London to visit? We miss you! Looks like you had a lovely meal there. 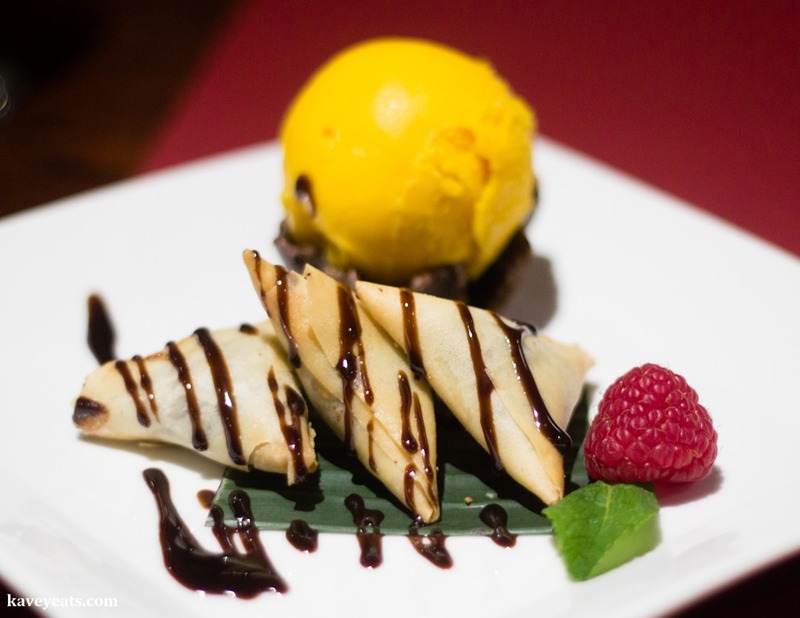 Chocolate samosas, umm… Must try these. I do make sweet + civolate stuffed parathas sometimes. Yeah was really good meal all through. I love the look of the Lamb Biryani sealed in with dough! Assume you eat the lid too? We didn’t, we had some naan bread ordered, but I guess one could? Traditionally I don’t know that one would because it would potentially get sooty or dusty within the oven, maybe? Not sure. The frying basket is one of those trends that wasn’t amusing when it first appeared and has deserved consignment to the bin for a long time! Yes, it’s such a central location and yet feels sort of overlooked! This sounds fantastic! It’s great to know of a fantastic restaurant in the heart of London, so easy to get to & The Strand is such a lovely hotel! I’ll be making sure to head down on my next trip! It’s a great location for tourists and those staying centrally for a work visit! Sounds like a lovely place to visit 🙂 The pakoras sound amazing with the pineapple & black onion relish! This place looks amazing! If only it wasn’t so far away! Next time you’re in London! Sounds like a wonderful restaurant! And your photos make the food look delicious! 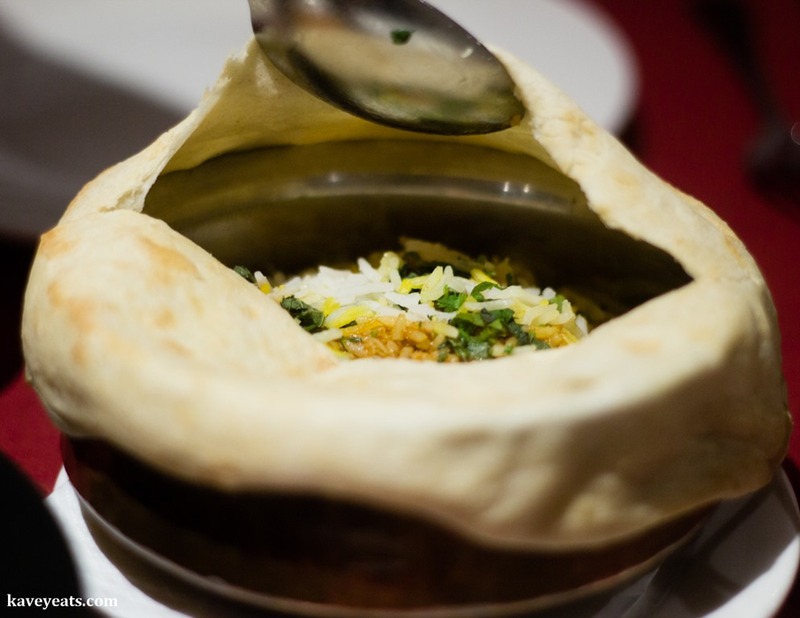 I love the bread dough lid over the biryani! Looks wonderful and sounds very delicious. Will definitely check this restaurant out next time I’m around Covent Garden. Yes, a classic way of cooking biryani. These days many people use foil or just a well-fitting lid but using dough is the traditional way! 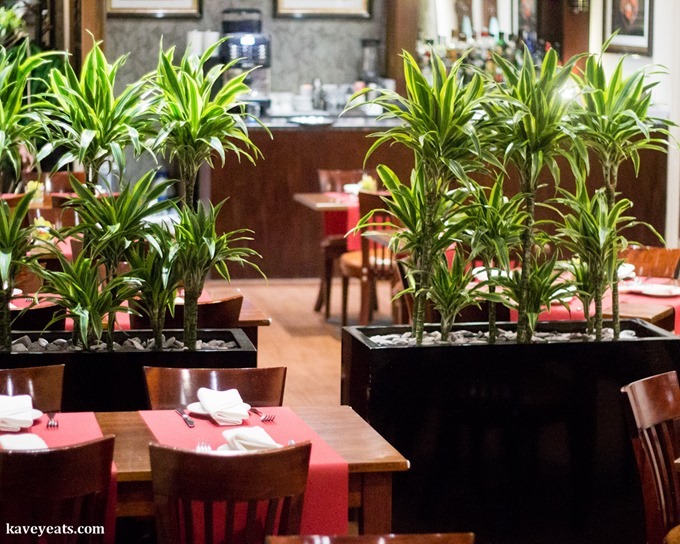 The restaurant is spacious and comfortable but is very hotel-restaurant in style, not very exciting. But yeah, the food we had was excellent! Oh wow this all looks incredible, I can just imagine the smell of that biriyani as the lid came off! Being from Leicester where we have arge Bangladeshi and Pakistani communities, I LOVE curry and it’s the one thing I’ve really missed in Australia. There is no good curry here. This place is on my list for the next trip to London. Yeah but Australia has some fantastic East Asian cuisine, particularly Vietnamese I think I read? It’s all about where the immigration has been from, and which people bought their foods with them! I can’t think of a time when I’ve been disappointed with Indian food at any of the places I’ve dined. However, it seems like you find the most amazing of their cuisine in unexpected places. The last place I dined in Memphis at Curry Bowl was the best I’ve had. Your meal looks just as delicious. Glad you enjoyed and shared it with us. We have a lot of what I’d call “curry house” type Indian restaurants in the UK, many of them serve a pretty anglicised version of Indian food – still very tasty but not as special an experience (for me) as places that serve really good real Indian food.